David Hitchcock and Alfred Selznick: Will the Real Director of Rebecca Please Stand Up? Professor Dennis Perry explores the heated relationship between Alfred Hitchcock and David Selznick in light of their film Rebecca. Lights dim, voices hush, and the rhythmic clicking of a projector fills the wide expanse of the theatre. The opening score begins in earnest and before we are greeted by the opening credits, a glaring banner simply reads “The Selznick Studio.” Then, as if to dispel any possible confusion, a title card informs us that the Selznick Studio is presenting this particular adaptation. Credits finally begin to scroll listing actors and actresses before Selznick’s name appears a third time, this time with a producer credit. It takes nearly a minute and a half, but we are finally introduced to the film’s director, none other than Mr. Alfred Hitchcock. 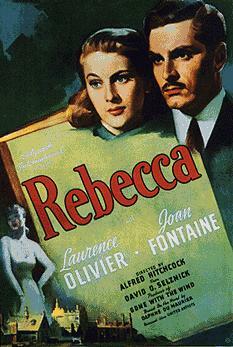 The year is 1940 and the film is Rebecca, an adaptation of Daphne Du Maurier’s famous novel of the same name. With a star-studded cast and Academy Awards for Best Picture and Best Cinematography, there is little doubt that the film was a success. Rather, the doubt circulates around the man who made this success possible: Was it the film’s producer, eccentric film mogul David O. Selznick? Or should the praise go to director and master of suspense Alfred Hitchcock? Hoping to clear the air and present a case for both sides is American Literature professor Dennis Perry, whose most recent lecture to BYU’s International Cinema allows the audience members decide for themselves who most deserves the credit for Rebecca. On one side, many argue that Selznick was the real force behind the film. Coming off the success of Gone with the Wind and described by Perry as “large and in charge,” Selznick may have been just a producer, but he prided himself on his intimate involvement with the making of each of his films. When Hitchcock’s team submitted their original draft of the screenplay, Selznick replied with a 3000-word response that alleged they had “removed all the subtleties” and demanded changes. Selznick got his wish but still provided a 10-page list of suggestions to the revised draft. Despite this domineering approach towards production, Selznick did provide meaningful changes that arguably influenced many of Hitchcock’s future works. Hitchcock was a man focused on form far more than characters. As such, many of his earlier films contained rather static characters. Perry argues that Selznick’s sometimes overbearing influence during production of Rebecca allowed not only that particular movie to shine with more dynamic characters, but it also allowed Hitchcock’s later films like Rear Window and Vertigo to feature much more nuanced protagonists. But, despite Selznick’s ever-present role in production, Hitchcock was not one to be intimidated into altering his own artistic vision. Hitchcock was far less concerned with staying true to his source material—a major concern for Selznick—and was more focused on what Perry described as “turning good books into great cinema.” This, of course, did not sit well with Selznick and was a point of contention between the two. Hitchcock undermined Selznick through his signature in-camera editing technique where he would only shoot the required scenes without providing extra footage for later editing. Perry noted that Selznick’s “OCD perfectionism” and amphetamine habit led to him often tinkering with and adjusting shots for hours at a time, but without the footage to do so, he was forced to abide by Hitchcock’s unique style. In the end, Hitchcock’s technique ended up saving both time and money, so Selznick begrudgingly resigned himself to the editing backseat. However, what might work most in Hitchcock’s favor is the simple fact that his legacy has far eclipsed Selznick’s. Rebecca may have been a clash between the era’s most well-known director and producer, but the controversy has become just another footnote in Hitchcock’s career. Still, according to Perry, Hitchcock himself did not see Rebecca as a “Hitchcock film,” and it is impossible to deny that Selznick had a meaningful influence on the film’s structure. The sides have been drawn, and the winner is ultimately up to the audience. To decide for yourself, check out Hitchcock’s and Selznick’s Rebecca which can be viewed here for free.